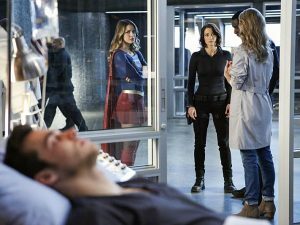 CADMUS unleashes a deadly virus that targets aliens and leaves Mon-El in quarantine, prompting Kara to try and learn what Lena really knows about her mother. Meanwhile Alex struggles to reveal her truth when her mother visits for Thanksgiving, and a pair of visitors arrive from a parallel dimension. Last edited by GateWorld; November 28th, 2016 at 11:14 PM. So interesting first ep of what they are calling the 4 part crossover..
First off we finally learn what that Medusa is that Robo hank was asking about in last ep.. Apparently its a super virus created to kill just non-kriptonites. FIRST OFF i would love to know how in the HELL Cadimus even knew about it, let alone WHERE and how to get INTO the fortress of solitude. Secondly, even WITH robo-hank having Kara's DNA on his hands thanks to the blood vial, are they really saying that the robot thinggy protecting it couldn't SEE the person wasn't Kara?? But glad to see thta since Mon-el is close to kryptonian, he wasn't killed instantly. And i wonder, did Ms White martian get offed?? Now that done, lets get into the whole Mom-daughter luthor angle. Initially when she got confronted about mommy dearest being part of Cadimus, and then handing over the element 343 thing.. i was fearing that daughter was actually in LEAGUE with mom.. BUT the double cross she did at the end, gave me hope back that she is NOTHING like her mom... GOOD WORK Gang. And Barry and cisco showing up.. Why did it take 3 times to break through??? Lastly.. WHAT was that ship/masked figures that seems to be hunting Mon-el?? Secondly, even WITH robo-hank having Kara's DNA on his hands thanks to the blood vial, are they really saying that the robot thinggy protecting it couldn't SEE the person wasn't Kara?? It could have been programmed to accept DNA as final evidence in case an intruder was disguised. My question is.. if the virus was to kill everything except Kryptonians, why didn't it kill humans? Or am I missing something? So basically with Flash episode we actually have a crossover and tomorrow will come Arrow and then we have more characters in crossover. And it ends with time travelers legends. I was so hoping to see other 3 tv series characters cross over to supergirl show but seems like we have with flash no only supergirl and flash team and then introduce Arrow tomorrow and 3 series characters might be in crossover. So basically legends will have all series characters in one show. And it's obvious medusa is the virus to kill off these aliens in the end. That's a point that was made elsewhere.. The only thing I can think of, is that Cadmus has some super duper geneticists on the payroll who modified Medusa to leave out humans from the killing mist..
Is it just me or is it getting ridiculous now that all the guys are falling for Kara? Does she have some kind of hidden super power that we don't know about that makes every guy fall for her? I dub thee, Not A Man. You never noticed how the lead always gets the attention of the men and women? Well yeah, but I hadn't heard the expression "lead character syndrome"
Is it just me or is it getting ridiculous now that all the guys are falling for Kara? Um, nope? What do you mean "getting ridiculous"? I can totally understand it, since after #sanvers she is my favourite of the show. Miss Luthor comes third. It's just, is it really necessary for every guy to fall for her? I wouldn't call itt necessary, per se. How about inevitable? Well, Cat's son doesn't count, he is her husband already.